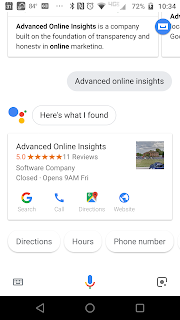 Advanced Online Insights News and Tutorials: How Many Places on the Internet Does Your GMB Listing Show Up? How Many Places on the Internet Does Your GMB Listing Show Up? The internet and the way people interact with it changes everyday. It seems like such a short time ago that I was logging in through a dial up modem listening to the screeches and squelches as the connection was being made. I would patiently wait to browse through music on napster or search the world wide web with a strange little search box that said Google above it in bright colored letters. Fast forward to today and I am always connected through multiple devices spanning multiple networks with no thought about connecting or ever waiting for access to any song, video, or answer to any question that I need to know right this minute. The way that I consume the internet has changed and it has changed for everyone. The idea of actively looking for a specific website or browsing multiple pages of information has changed; and with it the model for how a business owners or marketing agencies promote their brands and their image has changed as well. We have become a species that thrives on the ability to access relevant information instantly that allows us to weigh our options and make high level decisions. So what is the point I'm trying to make? When did I stop actively searching for websites for information and answers to questions? When did search start having all of the answers, and where is all of this information coming from? If you know me, then you know that I can't leave something like this alone and I'm willing to take it as far as I have to go to get an answer that satisfies my curiosity. I started by first looking at all of the different ways that Google displays search results and not just on a desktop PC. 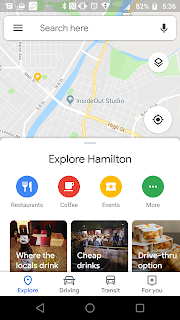 I opened Google Maps, Google mobile Search, and all kinds of apps that I frequently use... Google Trips, Google Assistant, Google Maps for mobile. The rabbit hole started getting way too deep and instead of following it for hours I set some rules and goals for myself and I wanted to share my results with you. I set a challenge for myself to sit for 30 minutes each day for an entire week and really look at Google Search from a whole new perspective. 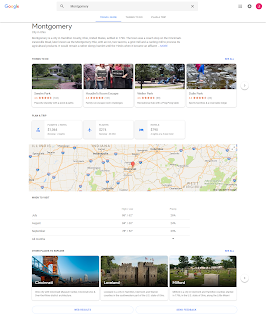 The goal was to open different Google Services and perform as many searches as I could come up with and document any and every occurrence in which the information in the search results came directly from Google My Business. This method produced countless variations of search results based on the terms I used. 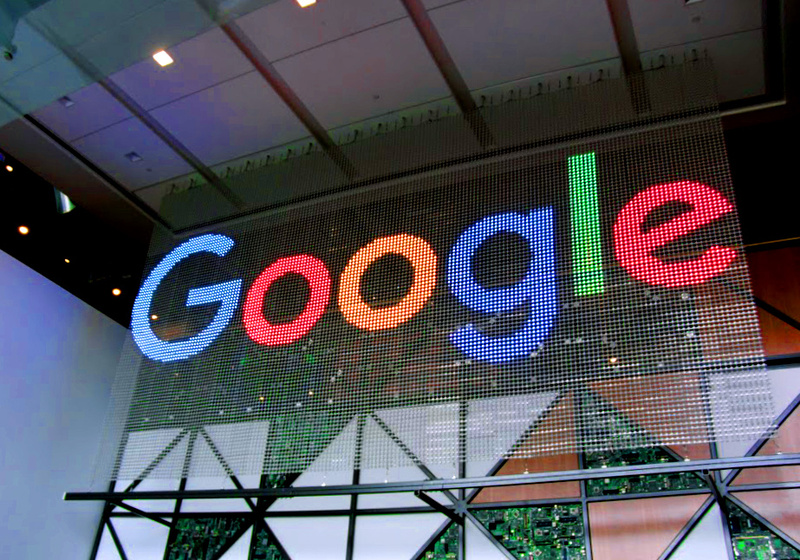 I am still convinced that I am just brushing the surface of what is possible and the future of what is to come as Google continues to learn more about what attributes define businesses. 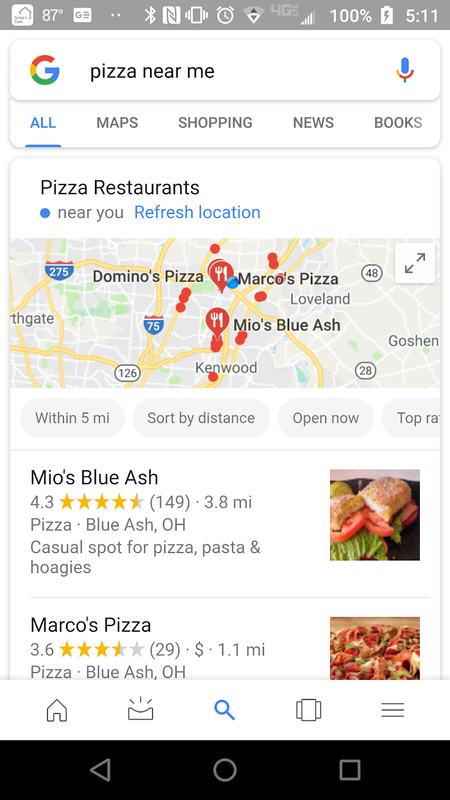 Google Search: pizza near me - The results of this search is a standard Google Local 3-Pack. 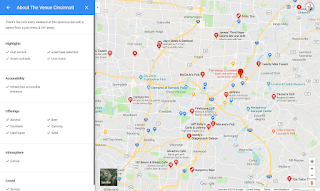 This 3-Pack also contains a filter search just below the map and generates business descriptions with categories if the data is present in the Google My Business Listing. 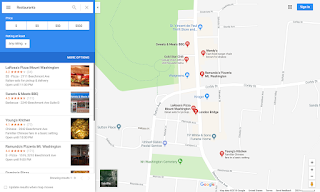 Google Search: most expensive restaurant near me - The results of this search take into account the extra information I provided "most expensive" and filtered the search by highest priced restaurants. Price is calculated by Google based on crowdsourced data and menu prices in the GMB Listing. 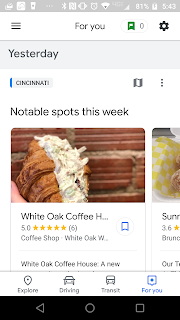 Google Search: best sushi in cincinnati - The results of this search take into account the extra information I provided "best sushi" and filtered the search by only showing restaurants with a 4.0 or higher rating and auto selected the restaurant category sushi. 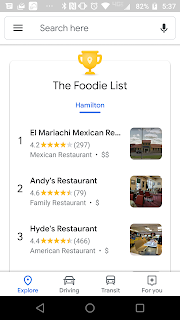 Knowing that only 4.0+ ratings appear in the search for "top rated", or "best" makes it a goal for businesses to work extra hard to keep their customers happy and their review rating above 4.0. 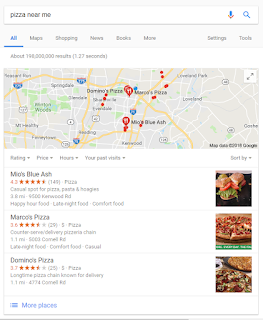 The category information is generated by Google and shows that providing detailed information in the GMB Listing allows Google to add this attribute data. Step 1.) 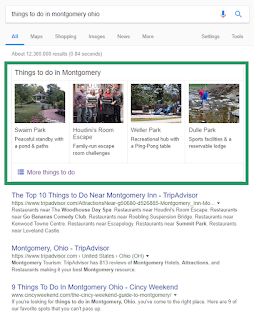 Google Search: things to do in montgomery ohio - The results of this search include a Google carousel or rich card view that produces local business listing information. 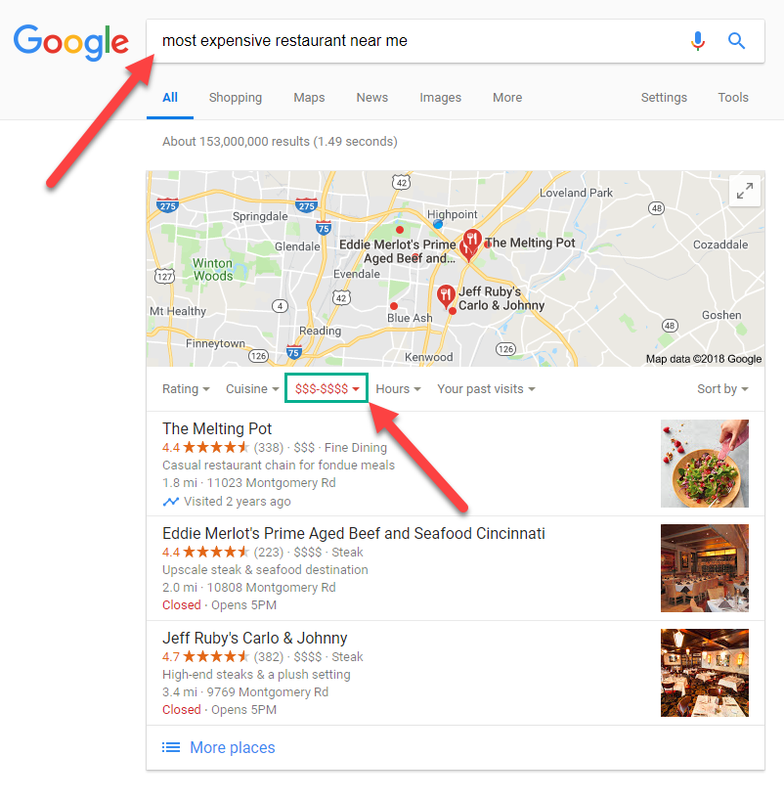 The exact metrics that cause Google to choose the exact results it provides is unclear but I believe that it has to do with the type of business and the amount of events associated with the GMB Listing. Step 2.) 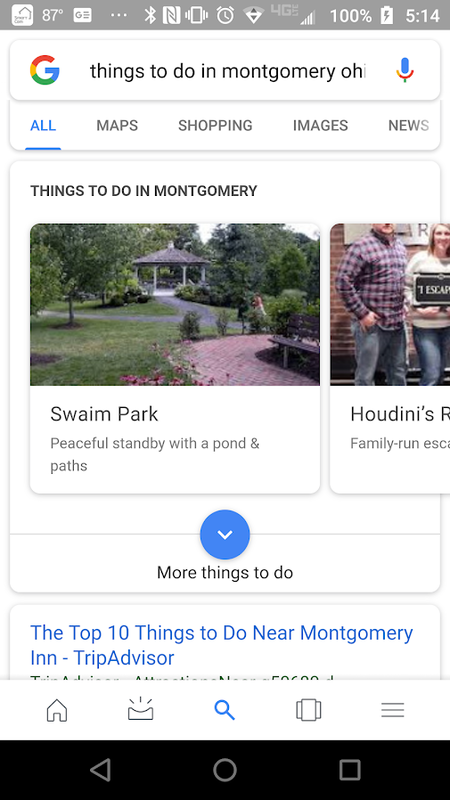 Click "More things to do" in previous search results page. 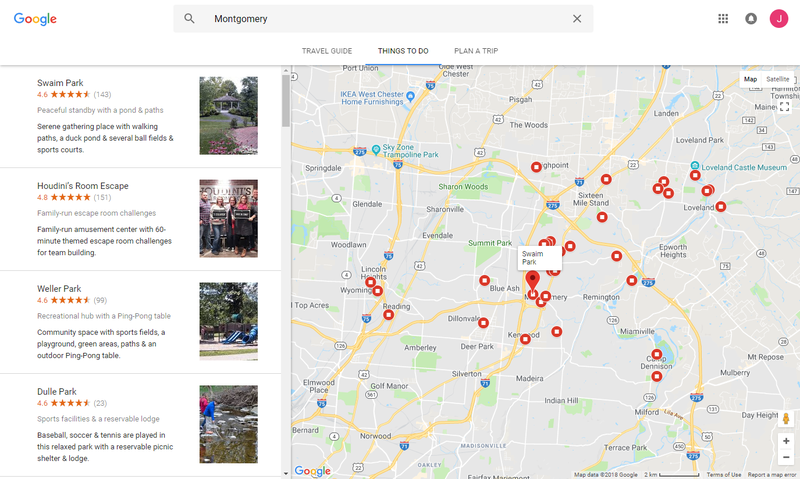 - The results are a Google Maps / Google Search hybrid page that shows more results and allows you to select other options on the map. All information in this view comes directly from GMB Listings. Step 3.) 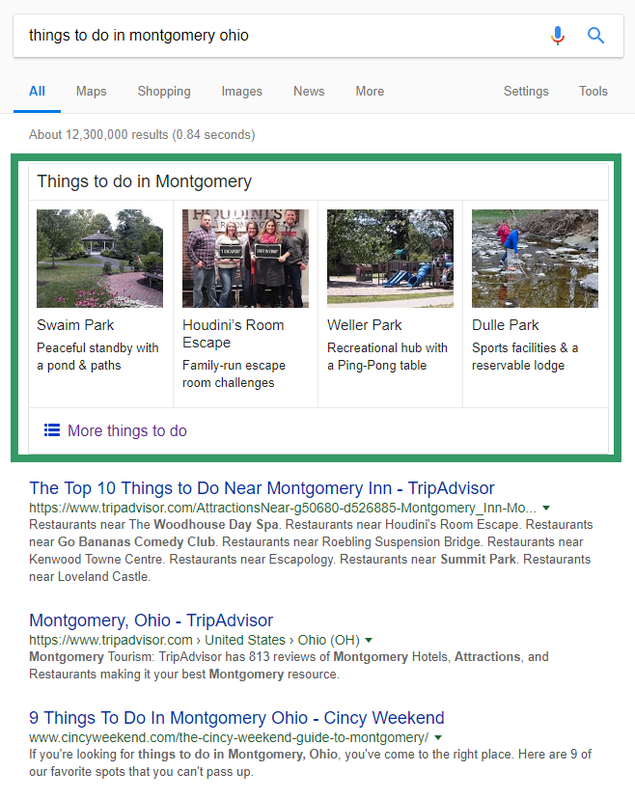 Click "travel guide" in previous search results page. 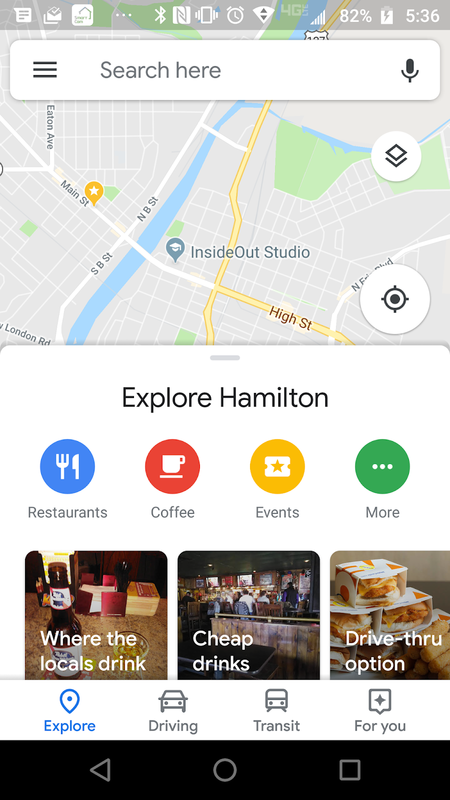 - This feature is relatively new and mirrors similar features in the Google Maps app for mobile and the Google Trips - Travel Planner app. I chose to use the exact same search terms that I used in the desktop search to determine how much, if any, of the data in the results changed. 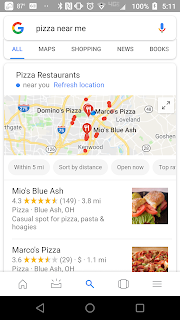 Google Search: pizza near me - The results of this search is very similar to the desktop search. The same information is present even with a smaller screen size. The main difference is the way that the search can be filtered. On a mobile device, Google auto-populates suggested filters as buttons instead of pull down menus. Google Search: most expensive restaurant near me - The results of this search auto selects the option for "Upscale" in the filters tab. 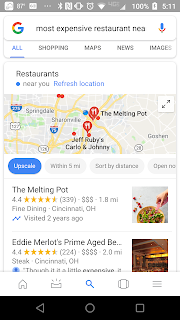 It's a little hard to see since it's cut off at the bottom of the screen, but the only other major difference in the mobile search is that a review is included in the Eddie Merlot Local Listing that has the word "expensive" in bold text. This strengthens the theory that Google continues to place a strong value on word in the reviews and their relevance. 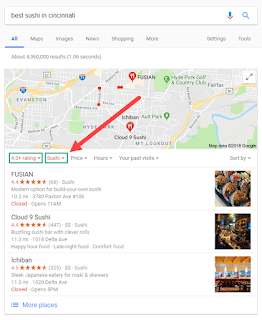 Google Search: best sushi in cincinnati - The results of this search take into account the extra information I provided "best sushi" and filtered the search by selecting "Top Rated" and only shows restaurants with a 4.0 or higher rating. It also auto selected the restaurant category "Sushi". The results also added a review with the word "sushi" in it and even more interesting there is a rich data snippet included in the Cloud 9 Sushi Listing with an earth icon and the text, "Top 5 Sushi Restaurants". Upon further investigation the rich data snippet is being triggered by an article titled "Top 5 Sushi Restaurants" and was published on the website cincinnati.com in 2012. 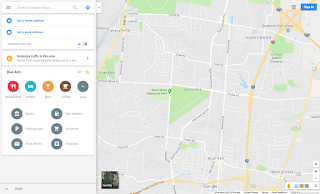 The pc version of Google Maps continues to produce rich search results though the recent updates to Google Maps on mobile leaves me wishing for the same functionality on the pc. 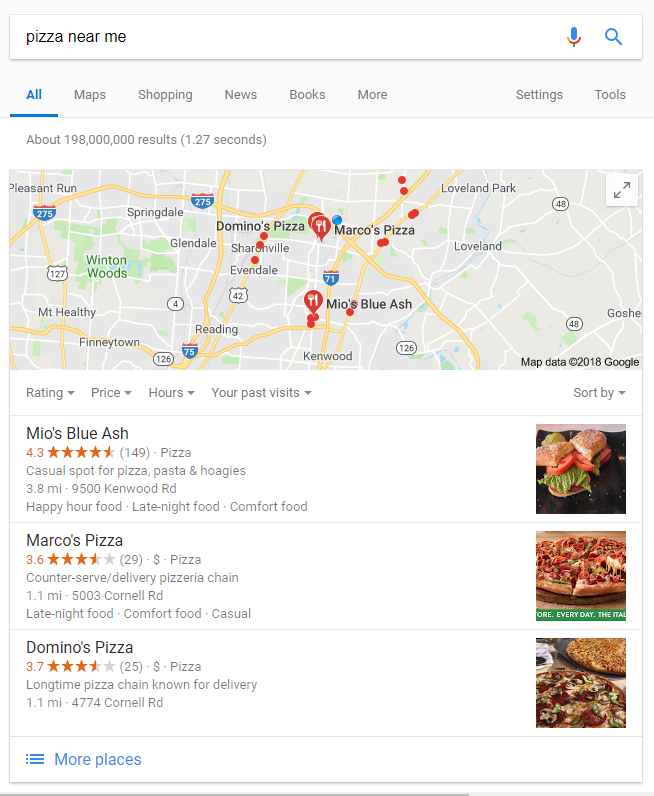 Let's take a look at some search results that are only possible with the information from Google My Business. Step 1.) 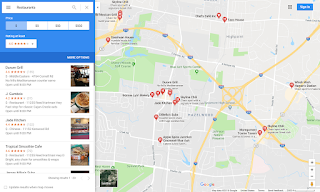 Google Search: restaurants - The results of this search produces local restaurant local business listings with the added search filter bar. 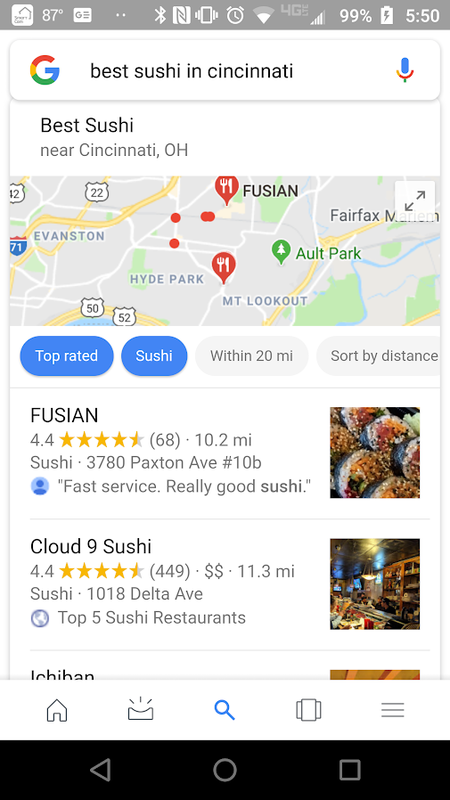 The filter bar continues to point to the importance of building a strong Google business listing with all attributes filled out properly and a good customer review rating. Step 2.) I selected least expensive and a rating above 4.0. 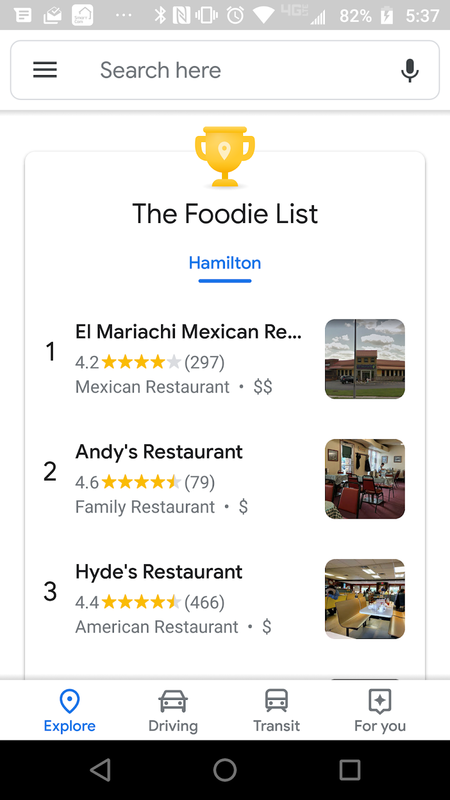 The following results reflect only businesses with the attribute data and customer review ratings that I specified giving me a good list of choices for low cost highly rated restaurant. 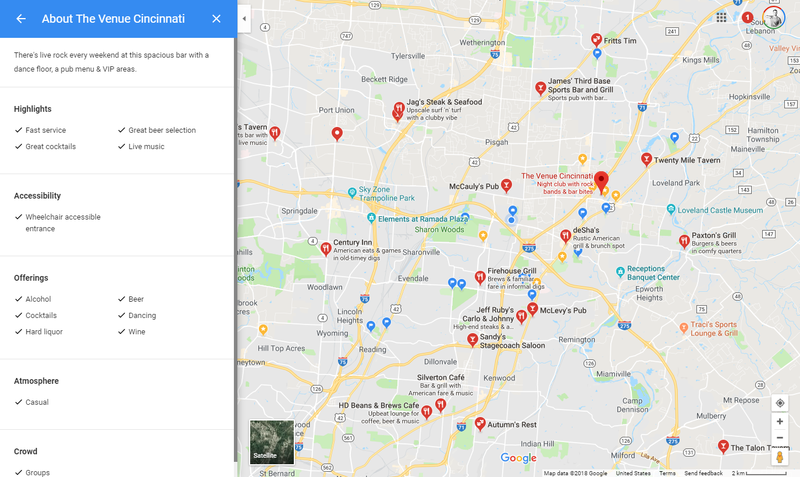 Another great feature in Google Maps is the ability to click any business's description to reveal all of the highlights and attributes associated with the business. The GMB Dashboard allows a business owner to select some of these attributes but also uses rich data and user generated content to learn about businesses over time. 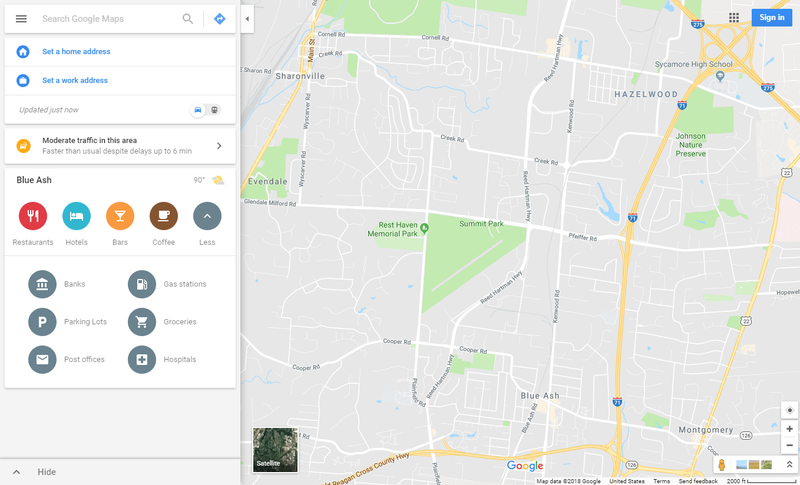 On June 28th, 2018 Google rolled out a major update for the Google Maps mobile app. The new material design was easily noticed by most users but many new features have still yet to be discovered by everyone. Nearly every added feature has been enhanced by the data available in business's GMB Listings. 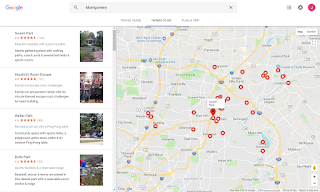 Let's take a look how much of an impact a fully optimized GMB Listing can have on the Google Maps mobile app. Right off the bat you can see the new design shrinks the maps view and focuses on all of the ways that you can explore local businesses. Also pay close attention to the new options at the bottom of the screen, especially the new "For you" button. The Google generated categories in the explore tab has been enhanced and contains richer categories. 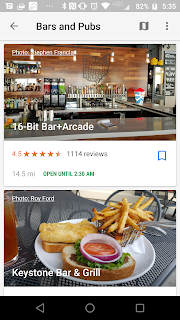 For example, instead of listing basic categories like "restaurants", Google has created more descriptive more relevant categories like, "Bars and Pubs", and, "Drive Thru Options". 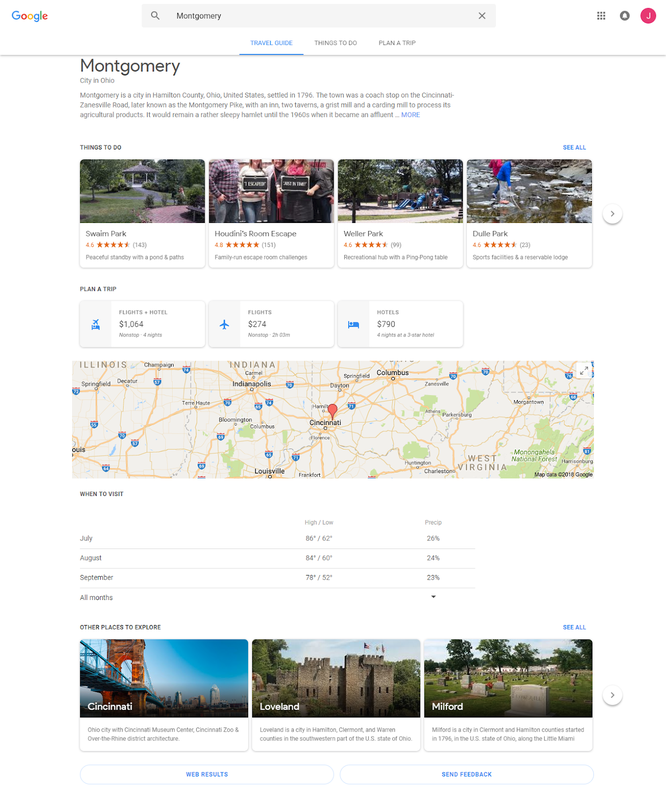 Google has taken into account how users search online and built out the categories to meet their needs in a very elegant way. One of my favorite new features added in the newest update is the "Foodie List". It can be found by scrolling down in the explore tab. This feature is very useful for someone looking to find a great unique restaurant in their local area. I have yet to put in the time yet to find out exactly what data metrics Google is using to create this list but its on my short list of topics to dive much deeper into over the coming weeks. 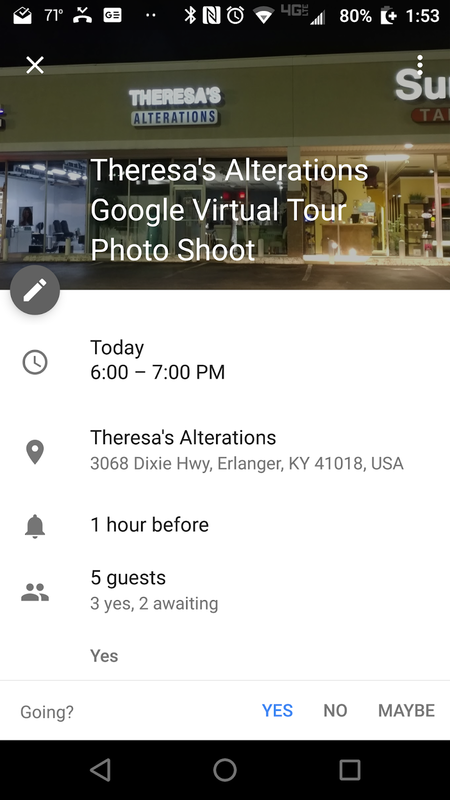 Google Maps for mobile now includes an "Events" button. This new feature adds the ability to zoom into any area of the map and events happening in the area begin to appear. You can select different ranges of dates depending on if you want to know what's happening today or this weekend. 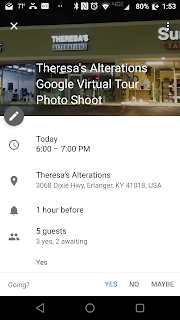 I can't think of a more important reason to add event posts to your Google Listings along with rich citation data on sites like Eventbrite or a public Google calendar on your webpage. Well I guess it's time to get personal. Google has went and created a specific page just for me on Google Maps titled appropriately, "For you". It's features like this that make me so happy that I have trusted Google with my location data and search history. I have found myself checking this page on my Google Maps app daily since it arrived. 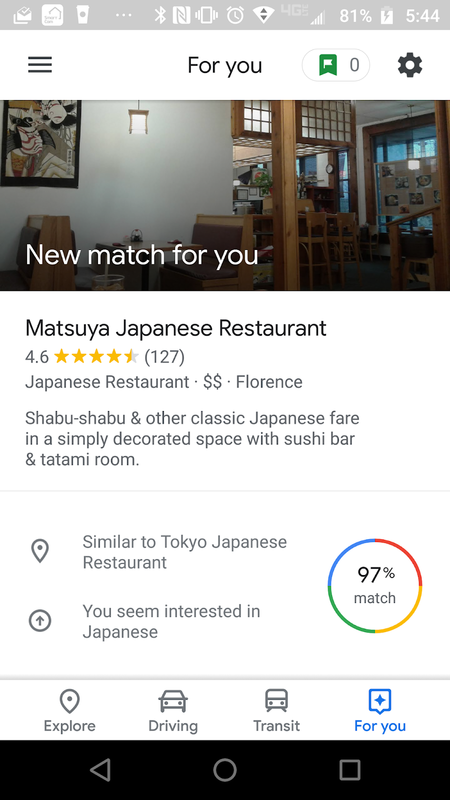 The "For you" section of the Google Maps app includes a new trending list everyday ,as well as, the "match for you" feature in the image above. 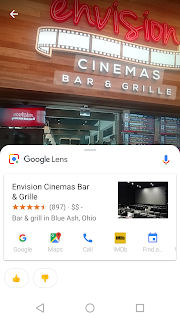 The "Okay Google" feature on your mobile phone takes Google Business Listing information and uses it to answer questions and even perform tasks. 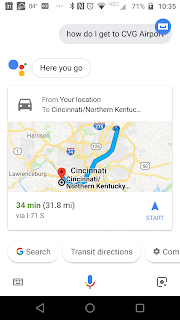 For example I can ask Google to "call Don's Auto Repair in Blue Ash" and without even touching my phone I am being connected with the receptionist Karen and scheduling an appointment to get my car looked at. 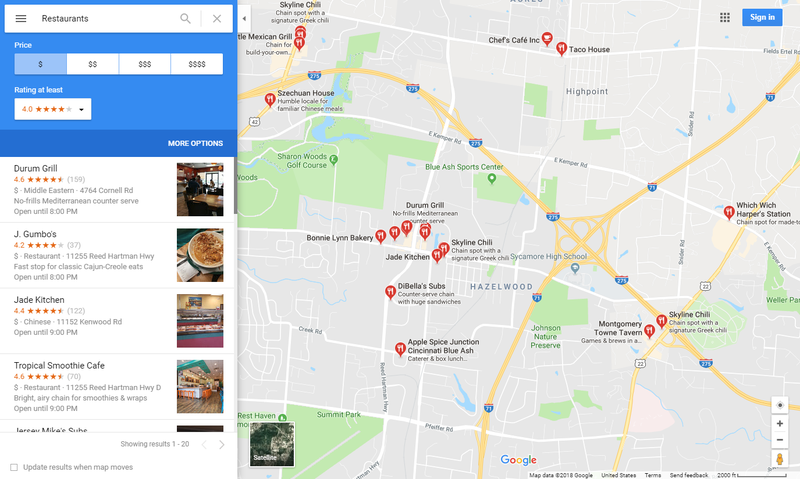 Without a Google My Business Listing, Google would not be able to perform this operation. 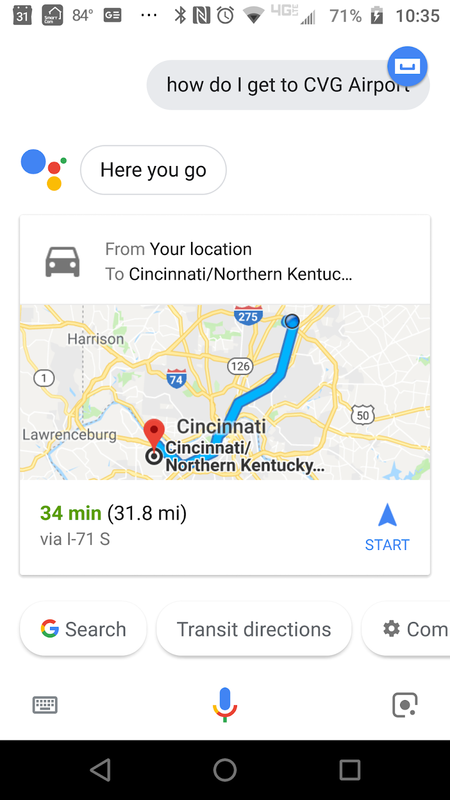 "Okay Google", "how do I get to CVG Airport" - I'm still amazed at how well this works. I mean I understand exactly how it works but that doesn't make it any less amazing that it does. The days of clicking and typing searches into our devices will be behind us sooner than we think. 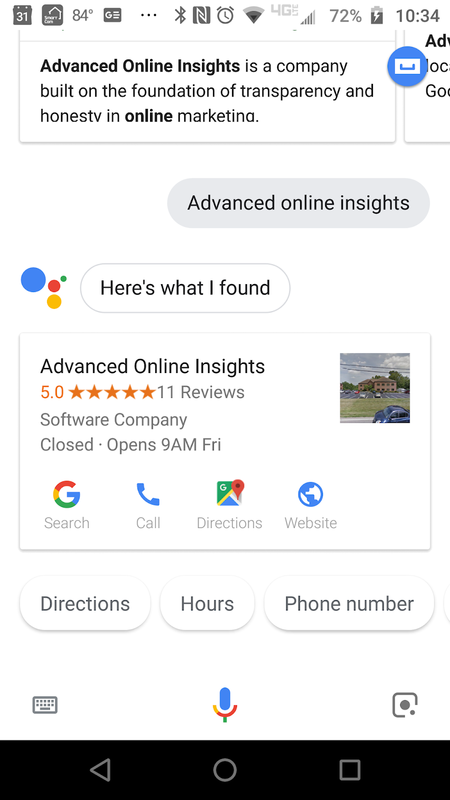 "Okay Google", "Advanced Online Insights" - Hmmm. That's everything I need right there in search. No typing, no clicks, just the exact info I need. GMB, ftw! What is this doing here you ask? 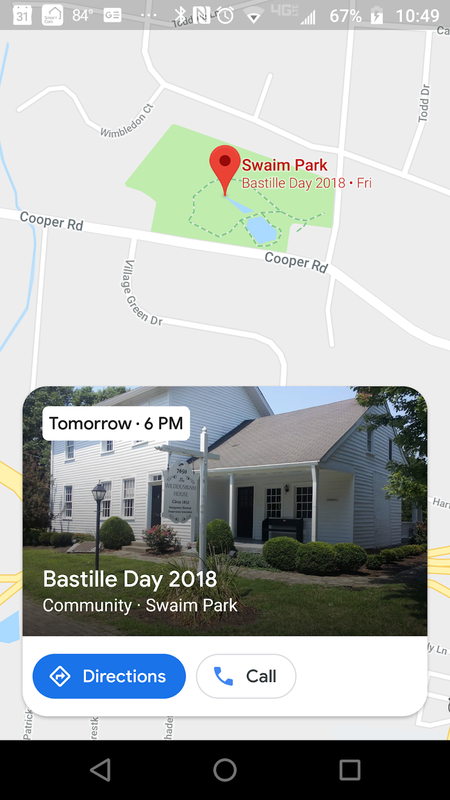 Well if you type the business name into the location for an event or meeting you get the cover image for the business in your agenda and detail view in your calendar. GMB is everywhere! GMB even makes an appearance in the Google Calendar app on a mobile phone. 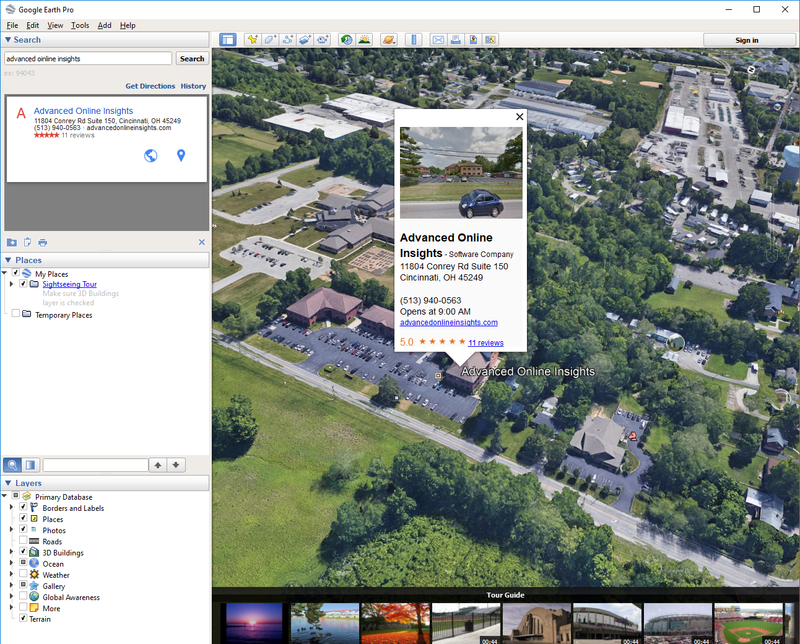 Google Earth contains datasets from many different Google Products and GMB is no exception. This app has been a huge asset to me as I have traveled over the years. It gets most of its data from GMB Listings and many of its features are starting to show up in Google Search and Google Maps. 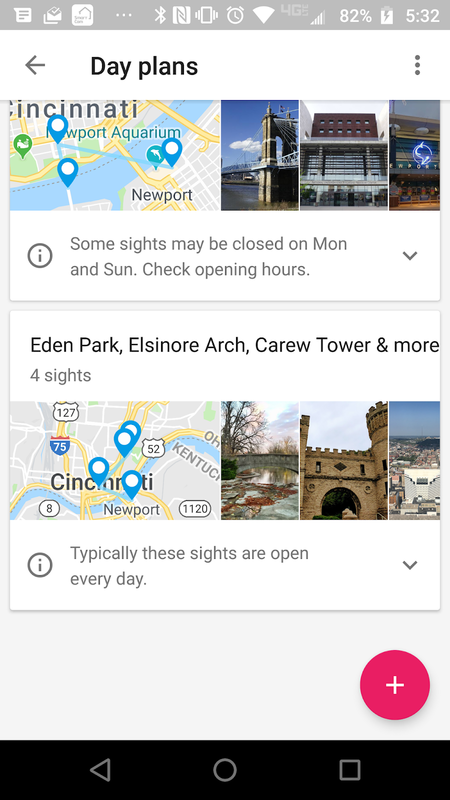 The main interface to the Google Trips app is, in my opinion, perfect. It elegantly gives you access to any reservations you have made for your trip by scraping the information from your gmail account. It also gives great recommendations for things to do in any city along with pre-planned day trip activities. 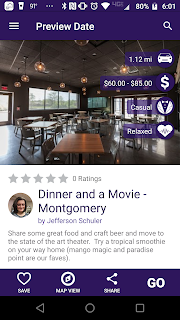 Things to do - Google curates a list of popular places and activities based on information in GMB Listings. Business Listings that are on these type of lists are the most visited places in a city. Day Plans - Not only does Google share things to do in a city it collects multiple locations and builds a group of places that can easily be visited in a single day with directions and detailed information. Day Plans - The map view in Day Plans gives you not only good recommendations of where to visit but how to get there. This one is not on everyone's radar but I use this feature quite a bit. You can tell the Google Assistant to set a reminder message for the next time you are at a specific place or business. It will notify you the next time you are at that place of your reminder message. 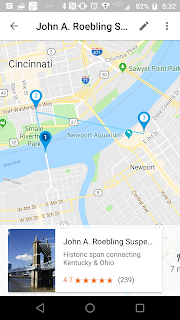 Another interesting fact is that Google allows developers to access the Google Maps API to create rich datasets to use in their mobile apps or websites. This accesses the Google My Business Listing information in all sorts of interesting ways. 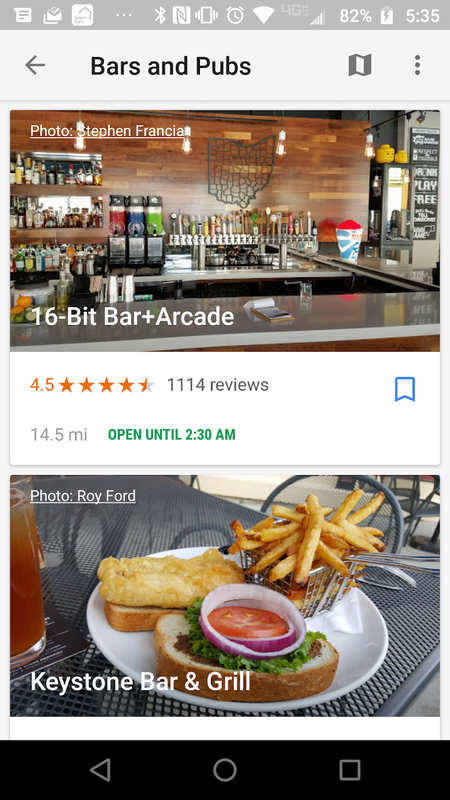 A local developer has a new app that is nearly out of beta and it uses GMB Listing information as one of its key components. The app is called DateCrawl and it provides date activities and restaurant recommendations based on price, distance, activity level, and attire. 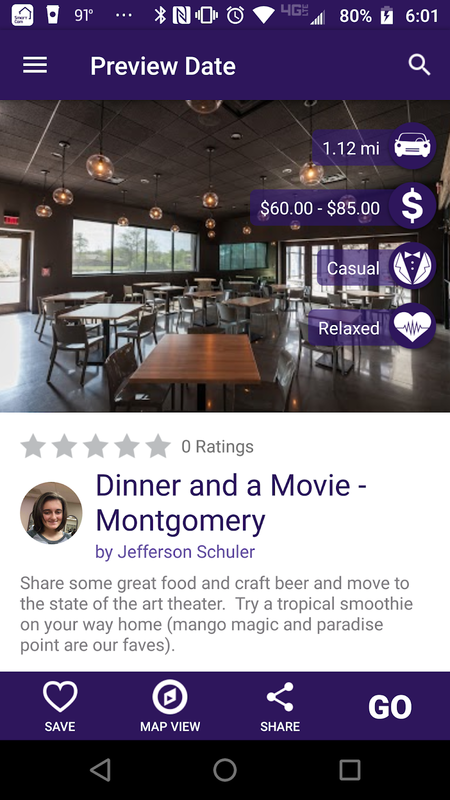 The app then searches for restaurants and activities near your location and provides prebuilt dates with several activities based on your search criteria. I have provided some screenshots to show how GMB Listing data is used by third parties in their apps and software. 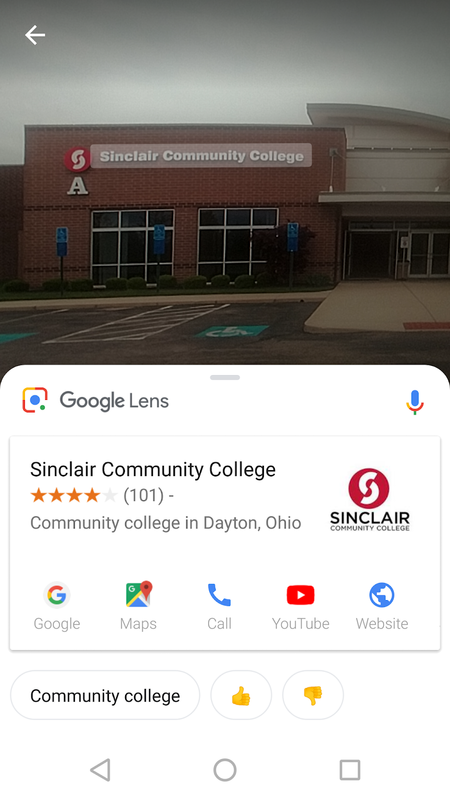 All of the business information and images used in the app come directly from the Google My Business Listings. Is name of business open? This amazing app is still in its infancy but already is beginning to become a way that I am searching more frequently. 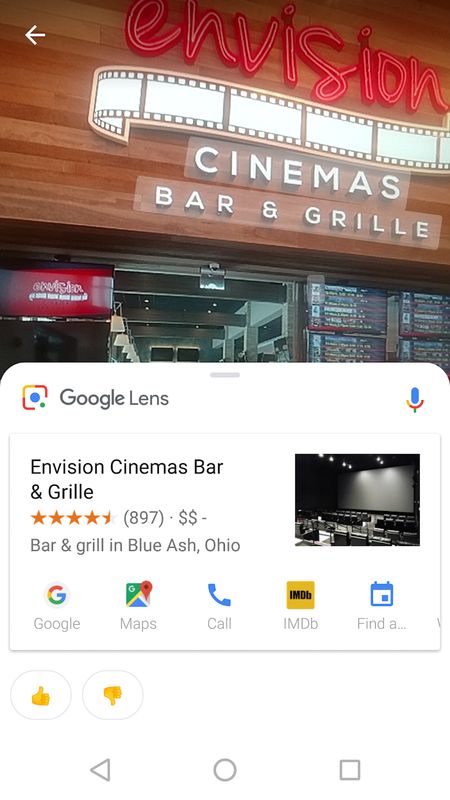 You simply open the app and Google Lens uses a live view of your camera and starts searching objects and places in the real world. This is the first step in real-time augmented reality that adds another layer to the way we will be searching in the future. No typing, no clicks, no voice, just point your phone at the real world and get search results. Does it seem important now that Google has a rich set of data about your business? Have you ever heard of a free service for business owners called Google My Business? Well, it's the future! If I told you 10 years ago that you could point your phone at Sinclair Community College and it would not only recognize it but it would do it instantly would you believe me? If you made it to the bottom of this post then you may be as crazy as I am. I hope that you have seen Google My Business used in a way that you hadn't seen before. 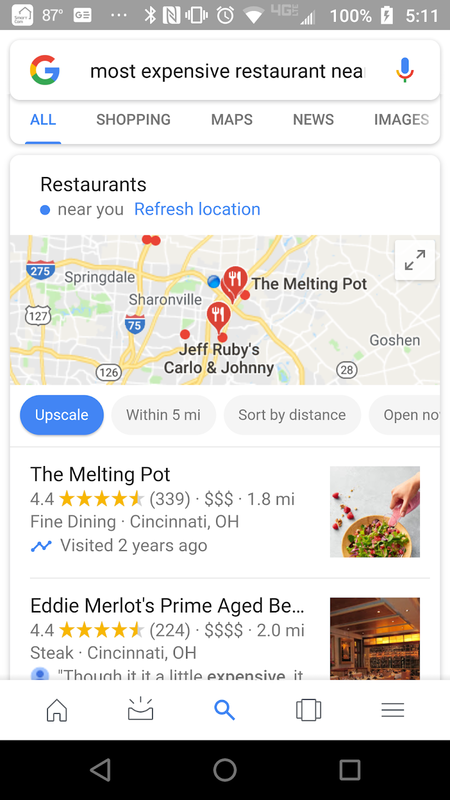 Also, take a moment and think about how you can use many of these scenarios to let potential clients know that their Google Business Listing may be showing up in more places than just the front page of Google. Feel free to share your own examples of places you have seen GMB listing data used online and reach out anytime with feedback or questions.